Needless to say, good Friends even harder still. 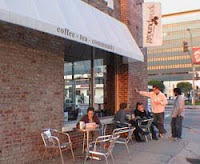 Speaking of which...one of mine now manages a 'groundwork coffee company' coffee shop in Hollywood. I'm told the java there is exceptional (heard this from a faithful Starbucks employee). One "coffee-hating" person I know told me, "They have good shakes!" You should check it out if you live in LA or ever plan to visit. When you do, ask for Whitney (the former seminary student). Click on the picture for the location. Im tired of the fakeness that comes with the dating game these days. I just want to meet a nice guy who can make me smile and doesnt feel the need to impress me with things that just dont matter. I did say "Christian" sites, right? I cannot seem to find any good guys my age out here. I find these guys who say they are Christian, but who's lives don't reflect that of one. I have been lied to sooo much. Not to be facetious, but, I hope this isn't a classic case of "looking for love in all the wrong places." I am out of a 4 year relationship with someone who doesn't have a relationship with Christ. I have finally figured out that it's to hard to be with someone who doesn't really want the same thing in life, "a relationship with the BIG man upstairs himself... aka "God"! I suppose the Scriptures don't make that clear enough. MEN ARE LIKE PARKING SPACES...THE GOOD ONES ARE TAKEN AND THE REST ARE HANDICAP...Women are like apples on trees: the best ones are at the top of the tree. Most men don`t want to reach for the good ones because they are afraid of falling and getting hurt. Instead, they just get the rotten apples from the ground, which aren`t as good, but easy...so the apples at the top think something is wrong with them when, in reality, they`re amazing. They just have to wait for the right man to come along - the one who`s brave enough to climb all the way to the top of the tree!!! Brilliant. Really. I sincerely hope that quote didn't come from a pulpit, somewhere. Though I'm tempted to think it might have. i think they're are too many normal/boring people on here. everyone says on they're profile "I'm just a normal person"...well, I'm not, I'm not normal at all, and honestly, I'm having my doubts about the kinda people that are on here, so please prove me wrong. i love my sleeping bag and my snowboard and my fishing rod. IM me! I am looking for someone 30-35 who is up for adventures, a good decision maker, honest and loyal. I am not into spectator sports and I like to spend my Sundays outside! You need not be a comedian 24 hours a day but a good sense of humor is a plus. I would love to find someone that is willing to try new things, go new places...at the drop of a hat. I have had a lack of adventure in the past few years and I am willing to make up for lost time. I love a guy who smiles a lot, always has upbeat things to say and can point out the good things in life as well as discuss the not so wonderful situations that may come up. We all enjoy having fun (...duh!). But, is it the first thing we want someone to know about us? Seems that way with more than a few. I am 24years old with two little girls...I was once married when I was 19 but the marriage ended after about 3years. It was no ones fault just to young to make that type of commit[tment]. Hm...and here I was thinking willful divorce is an affront to a Holy God. (Guess it's a good thing you can get 'em cheap, huh?) ...Grrrr! proud to be a slave!